Purpose: The purpose of this study was to develop a new PLGA based microsphere formulation aimed to release the olanzapine for the period of one month which will result in increased compliance. Methods: Microspheres loaded with olanzapine were prepared using oil in water emulsion and solvent evaporation technique. The microspheres were characterized by surface morphology, shape, size, bulk density, encapsulation efficiency, and Fourier transform infrared spectrometry. In vitro release studies were performed in phosphate buffer at 37°C and in vivo studies were conducted on male Sprague- Dawley rats. Results: The morphological results indicated that microspheres produced were having a smooth surface, spherical shape and the size in the range from 9.71 to 19.90 μm mean diameter. 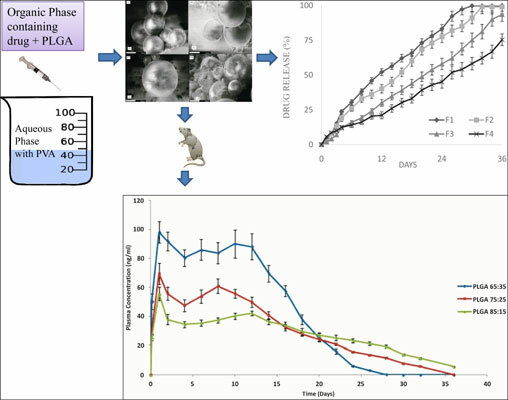 Encapsulation efficiency of olanzapine loaded microspheres was in the range of 78.53 to 96.12% and was affected by changing the ratio of lactic to glycolic acid in copolymer PLGA. The properties of PLGA and other formulation parameters had a significant impact on in vitro and in vivo release of drug from microspheres. In vitro release kinetics revealed that release of drug from microspheres is by both non-Fickian diffusion and erosion of PLGA polymer. In vivo data indicated an initial burst release and then sustained release depending on properties of PLGA, microsphere size, and bulk density. Conclusion: This study indicates that microsphere formulations developed with PLGA (75:25) and PLGA (85:15) have provided a sufficient steady release of drug for at least 30 days and can be potential candidates for 30-day depot injection drug delivery of olanzapine. Schizophrenia, compliance, psychosis, solvent evaporation, pharmacokinetics, long-acting injections, biodegradable polymer.